Uglyworld #1108 - Volcano Supplies (Project BIG - Image 144 - 365), originally uploaded by www.bazpics.com. I is beginnerings to gets a little worrieds as we is supposered to flies home tomorrow from Americas and with alls the mad volcanoes stuffers I wonders if we will gets home withouts bigger delayings. 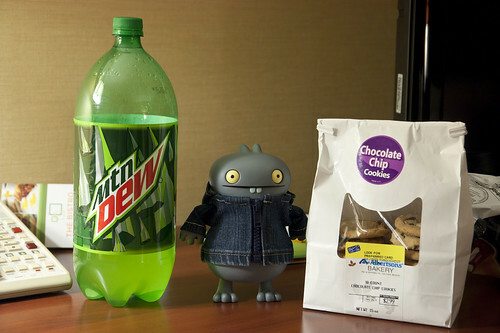 I mades sure to stocker up on goodies in advancer, Mountain Dew and some choco chippo cookies, hopefullies they will keeps me going if we has any delayers. Can you alls wish for the ashers cloud to goes away untils the weekend please?